Bad Timing is a web series all about Andy, a lovably awkward IT guy whose main defense mechanism in any uncomfortable situation is to crack jokes and laugh. Living at the end of the world, he’s fast becoming a comedy genius. As the Zombie Apocalypse grinds society to a halt, he finally has an opportunity to start a relationship with the girl of his dreams. The beautiful and aptly named Eve is everything he’s ever wanted, even if he’s the last guy she’d have ever paid attention to beforehand. As the two begin to bond through a series of hilarious mishaps, you almost think that this is the start to a beautiful love story. That is, until, the hunky, supermodel-esque Kevin arrives to sweep Eve off her feet and turn Andy into a perpetual third wheel. Just as the trio begins to find a sort of rhythm to their new lives, Zombies begin to beat down the front door. In an uncharacteristic moment of bravery, Andy defends the home as Eve and Kevin escape. Unfortunately for Andy, what he was expecting to be the living dead was, in fact, his overbearing, overprotective mother coming to check on him. Billed as a romantic comedy with Zombies, Bad Timing lives up to its name with every episode centered around some poorly timed circumstances that help to make the end of the world just that much more difficult for those who survived. From awkward reminiscence about battling the undead while still covered in their blood, to inconvenient house guests (and boners), and Zombies surprising the survivors when they least expect it, the show lives up to its title and derives its humor from the sort of things that happen in everyday life, while using the backdrop of the end of days as the largest of these little SNAFUs. The show never takes itself too seriously, which is refreshing, as most Zombie/post-apocalyptic stories are so maudlin and depressing that they’re barely tolerable, except in small doses. 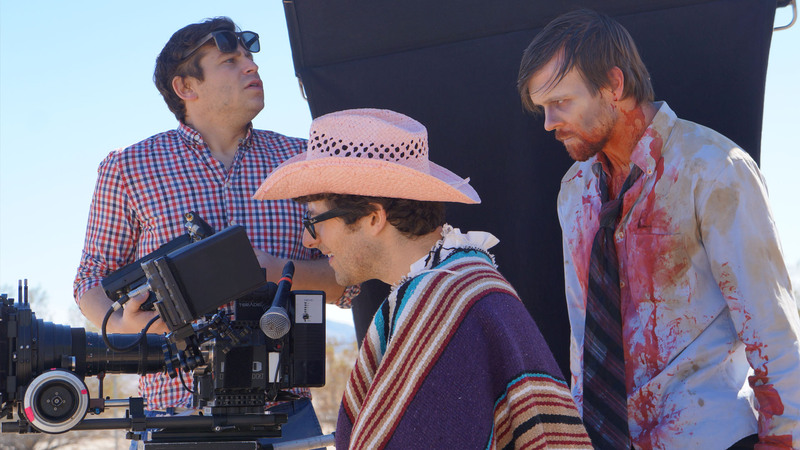 Director/Star Andy Goldenberg checks the shot while Zombie Brad looks over his shoulder. The Zombies, though few and far between, are beautifully done and a bit different than anything you’ve seen before. They have an almost haunting, spectral sort of pallor that makes them feel normal and understated. Splashes of red around their mouths and wounds are a jolt in the overall design, and the way they move and interact with the living cast is incredible. Andy’s interaction with the living dead, especially, opens the door for the potential that maybe there’s something darker going on with our hero than bad luck and bad timing. 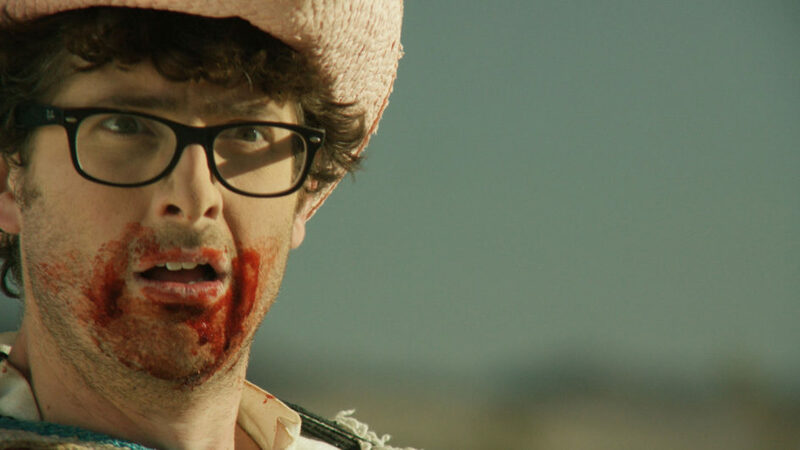 Written, directed and starring Andy Goldenberg, Bad Timing is almost more an isolationist-horror comedy than a Zombie-horror comedy, with the atmosphere created and the lack of other people going a long way to support the idea of being completely alone with the woman of your dreams. I mean, who hasn’t at least fantasized once or twice in their lives about what or who you’d want on a deserted island with you? That’s exactly where this story goes. Now, I refuse to give spoilers on this, because the entire series, thus far, is only about two hours long. After all, it’s a web series, so each episode only lasts a few minutes, but there is a lot of story crammed into those two hours. You can catch up on it in the embedded links below and then make sure to subscribe to Goldentusk’s Youtube channel for updates on this and other film projects. Bad Timing is a romantic comedy for horror and Zombie fans and I can only see it getting better as the series continues. With each season ending on a cliffhanger, fans will have to wait until Season 3 for a resolution to Andy’s latest misadventure.